We are in dire need of additional Eucharistic Ministers at our 8:30 am weekday Mass. We usually have two cup ministers and one bread minister assisting the presider at this Mass. The time commitment would be weekly, from Monday thru Friday, once every four or five weeks, depending on the number of Eucharistic ministers involved. If you currently are serving as a Eucharistic minister at our weekend liturgies, and would like to answer the call for help at this Mass or would like more information, please contact Deacon Gerry or Donna Zych at 773-745-9057. 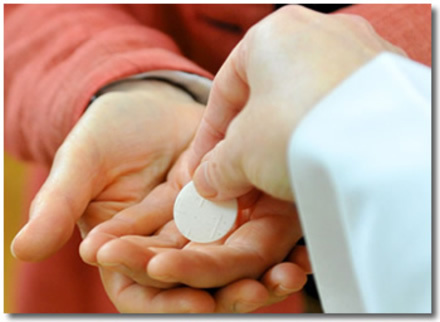 Benefits – spending some extra time with our Lord during the week giving His Precious Body and Blood to our brothers and sisters while helping to fill a need at our 8:30 am Mass. If interested, please reply as soon as possible as a new schedule will begin in May. Thank you for your consideration. Eucharistic Ministers help distribute the consecrated bread and wine to the community. These extraordinary ministers of communion are integral to the sacramental sharing that is part of the celebration of the Mass. Initial formation and training are offered a few times each year, and Eucharistic Ministers typically serve on average two Masses per month. To learn more or to be put in contact with the coordinator of this ministry, please contact Alex Ryan, Liturgy Coordinator at 708-383-3430 x 403 or email her at alexryan@stgilesparish.org.